“Got me a 1971 Beetle,” announced Ed Stetzer on Facebook last April, adding that he and his daughter were planning to restore the classic Volkswagen car. However, what Stetzer didn’t mention was how he had obtained the car. Getting paid for these kinds of jobs and engagements is common among Christian speakers and leaders. However, Stetzer’s receipt of a large gift from a celebrity pastor like MacDonald raises conflict of interest issues, given Stetzer’s position at Wheaton College and especially his role as an editor for Christianity Today (CT). When I raised this issue with Galli, he said, “Stetzer is not on staff with CT; he blogs, and some of his blogs appear on CT. He’s not a journalist, he’s a writer—but he’s independent of CT and is not accountable to CT.” Galli added that Stetzer does not receive any money from CT and his title of “contributing editor” should be seen in that light. However, Galli later admitted that CT pays the Billy Graham Center a fee for Stetzer’s regular contribution to the media outlet. Also, Stetzer doesn’t just write blogs for CT; he manages one of eight special sections on CT’s website called “The Exchange with Ed Stetzer.” The Exchange also serves as a landing page for everything Ed Stetzer, including his regular columns, podcasts, and work with the Billy Graham Center and Lausanne North America, a network of influential church leaders. Galli admitted Stetzer’s role after I told him about a recording I had heard of MacDonald and Weber’s conversation. This recording was aired in part on a podcast by Chicago radio personality, Mancow Muller. At the beginning of that conversation, Weber tells MacDonald, “Even Singapore is not far enough away to get away from Ed Stetzer.” Weber then says that Stetzer had relayed a message from MacDonald and that’s why Weber had called MacDonald. Innocent or not, I found it improper that Galli, a journalist, would be reaching out to me, a defendant, on behalf of a plaintiff—and I told him so. I added that if Harvest wished to speak with me, they could have their attorney contact my attorney. Plus, there was nothing to reconcile. At that point, I hadn’t written anything about Harvest, and the lawsuit was merely an attempt at prior restraint. Then in December, after my exposé on Harvest published in WORLD, CT published an article, entitled, “Harvest Bible Chapel Disputes World Investigation of James MacDonald.” This article included Harvest’s full, verbatim press release. CT’s unusual coverage of the Harvest scandal doesn’t necessarily show collusion between Stetzer, MacDonald, and CT. But it certainly raises questions, especially in light of the gifted car. But it’s not just Stetzer’s position with CT that may present a conflict of interest. However, Stetzer is involved in a plethora of other organizations, which could potentially involve conflicts of interest. He serves as the executive director of a network of church leaders, called Lausanne North America; serves as interim pastor for Moody Church; hosts a program on the Moody Radio Network called Ed Stetzer Live; and serves as teaching pastor at Highpoint Church, a former member of Harvest’s now-disbanded church planting network called Harvest Bible Fellowship (HBF). Interestingly, CT published an interview Stetzer conducted with Kent Shaw, former executive director of HBF, on The Exchange in 2016. Though Stetzer’s car may be the only reported incidence of MacDonald gifting a big-ticket item to someone outside the church, several sources told me that MacDonald had a regular practice of giving large gifts with the church’s money to people inside Harvest. Betsy said James MacDonald’s wife, Kathy, had told her that James had bought the gifts with his own money. But Betsy said she and Dave always suspected that the church had paid for them. I reached out to Kathy MacDonald for comment, but she did not respond. MacDonald also reportedly gave Harley Davidson motorcycles to at least two Harvest pastors. 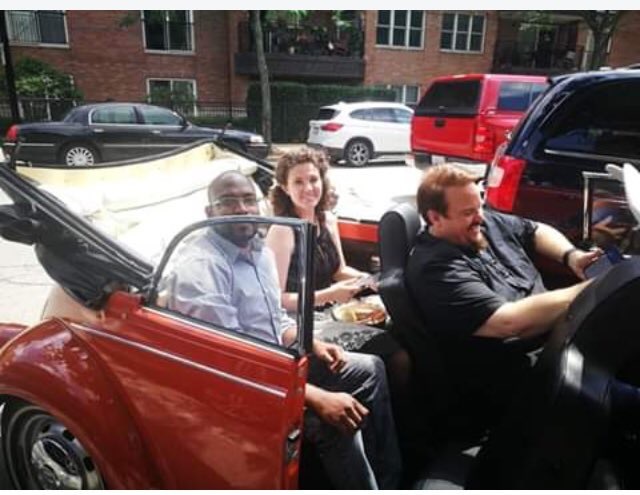 One of them was Niles Campus Pastor Mohan Zachariah, who yesterday confirmed in an email posted on the Wartburg Watch that in 2017, MacDonald had given him a Harley. Zachariah said he didn’t think the gift was “unusual” because he “was aware of (MacDonald’s) gift-giving to others” and “believed it was a gift from (MacDonald).” However, Zachariah said that after learning that the church had paid for the Harley, he reimbursed the church for the motorcycle and put the bike up for sale. I emailed Zachariah, asking him if he knew which fund at the church was used to pay for the Harley, but he did not respond. According to former Harvest Comptroller Alan Tsao, the church also gave a Harley Davidson to former Assistant Senior Pastor Rick Donald. Tsao said the funds for the purchase did not come from the portion of the budget he controlled, but likely came from the “black budget.” This is a portion of the church budget—about 20%—that according to Tsao, was hidden from all staff except MacDonald and former Harvest CFO Fred Adams. I texted Rick Donald and asked him about the motorcycle and who paid for it, but he did not respond. I have reached out to other former Harvest employees who reportedly also received Harleys but have not yet heard back from them. Meanwhile, Stetzer will be speaking today at The 2019 Small Town Pastor’s Conference. According to the National Association of Evangelicals, the average small town pastor makes less than $50,000. Let’s describe the “gift” to Ed Stetzer with the correct word, “bribe”. The large gifts to staff are illegal unless the cost of the items was included on the employees’ W-2 or 1099. If this was not done, the correct words are “tax evasion”. The rumor mill says this matter of the unreported gifts to staff is going to get a lot worse, Joe Blow. I wonder if Highpoint will distance itself from Ed. It would be the typical move they employ to make themselves look better than they are. The last thing they need is someone asking around about the same things we now know about James MacDonald. This is a blog from You Are Not Alone, regarding prostate cancer and James’ story is reported there…. I notice a final portion written in late 2017, and wonder how much this journey of his affected decision making and responses. I am not justifying or excusing. Just wondering. Give James MacDonald no pass. Pray instead that he and those around him who were greedy for fame or gain will repent before they fall into the hands of the living God. If with all your heart you will give attention to the voice of the Lord your God, and do what is right in His eyes, giving ear to His orders and keeping His laws, I will not put on you any of the diseases which I put on the Egyptians: for I am the Lord your Life-Giver” (Exodus 15:26 BBE). IF he had it and IF he was healed was only so he could do more damage, my Father in Heaven was not involved in any of it. I hate to sound callous but if it were true that MacDonald’s abilities to exhibit sound judgement was affected by his prostate cancer, then that would mean that everything he has taught in his corporate church, walk in the word, ect. would also be devoid of sound judgement and that the legal rights to those sermons that he is desperately trying to control are in fact, worthless. No, this sounds like the other comments made by those resigning in disgrace and appealing to the emotions of others on the way out. I’m not a Dr, so perhaps that’s why I didn’t realize that one of the side effects of the single most common type of cancer for men (and the most curable), was that one became an arrogant, narcissistic jerk. Who knew? Each time i log on it seems the previous outrageous act of control and sheer greed reported just tops one after the other. And why is Trump still in office? Because he was elected and the economy is on fire. You probably STILL have your job because of The Donald. Best president ever! A man that loves his country and has not lived an exemplary life. Bring the blessing of God at every opportunity on our country. Can we put yours on display for the world to see. Many would call for your firing also. You are a fool and I am publicly calling you out. 63 million and maybe more love what Trump is doing for the country. Obama, Satan’s minion, hates this country and is doing the continued apology tour via the demoncrats. @Julie – I appreciate what you are doing to “bring to light what has been done in the dark” though I grieve the church – Harvest Bible Chapel in particular and the church at large. However, I have hope because Jesus continues to build His church! A question that continues to linger in my mind is “why wasn’t James MacDonald’s defense of his lawsuit rejected by Christianity Today on the grounds of terrible exegesis?” Mark Galli continues to defend running MacDonald’s piece “Why Suing is Sometimes the Biblical Choice” in Christianity Today. Don’t they have anyone on staff to vet the articles to determine if they are even Biblical? I read MacDonald’s article and it was terrible Hermeneutics, terrible Exegesis and as a result a terrible conclusion. MacDonald did eisegesis where he read into the text what he wanted to see because he was looking for an excuse to sue and therefore twisted Scripture to make it fit his purpose. I realize that there is concern about how and who opened the doors at CT to make it possible for MacDonald’s article to be printed. To me, the bigger question is why was it run in the first place since Scripture was misused and abused so badly? Hi, Julie. I have not always agreed with some of your interpretations of Scripture, in the past. However, the way you have handled yourself in this matter of dealing with James MacDonald and HBC is commendable. It shows that you are a woman of integrity and honesty. Thank you for your integrity and faithfulness. Being part of the Evangelical machine is a great gig, if you can get it. Use a “church” as your own personal ATM. Pray and Pray for all involved. But for the Grace of God there go I.
Pray and pray WHAT? And why would you quote the words of of a dead man burned at the stake in 1555 instead of encouraging all of us with the pure Word of God? I’m pretty sure this is a good example of the lukewarm culture of a lot of “churches” these days. WAKE UP !! !